A spot in the 2015 Fed Cup World Group will be on the line on April 19-20, 2014, when the U.S. Fed Cup team will host France in the Fed Cup by BNP Paribas World Group Playoffs at a U.S. site to be determined. The winner of the tie will stay in the World Group for 2015, while the loser will be relegated to World Group II for the 2015 Fed Cup campaign. France is led by No. 25-ranked Alize Cornet and No. 71 Kristina Mladenovic. The U.S.'s top player, world No. 1 Serena Williams, is 3-0 career vs. Cornet, and has never faced Mladenovic. The U.S.'s No. 2 player, No. 18-ranked Sloane Stephens, has never faced Cornet and is 2-0 career against Mladenovic. The U.S. is 11-1 all-time against France, the lone defeat coming in the 2003 World Group final in Moscow, Russia. The U.S.'s choice of location and court surface for the April tie will be announced at a later date. It is the second straight year the U.S. has lost in the opening round and has had to contend the playoffs round. "We always prefer to play at home, that's for sure," said U.S. Captain Mary Joe Fernandez. "It's going to be tough. We played Sweden last year in the playoffs [winning in Delray Beach, Fla.]." For more information go to www.fedcup.com. Kids love playing on teams, from junior team tennis to middle school tennis to high school. Now the new USTA Florida Regional Team Tennis Challenge is bringing recreational team play to Ft. Lauderdale-area children. USTA Florida's Team Tennis Challenge, presented by Wilson Racquet Sports, will be hosted by the Midtown Athletic Club in Weston on April 12-13, 2014. The two-day tournament will host teams with a minimum of two boys and two girls, and no more than eight players per team. Age divisions include 10-under Advanced, 12-under, 14-under, and 18-under, with three skill divisions: novice, intermediate and advanced. These "BYOT" (bring your own team) events do not require previous team tennis league participation. Both USTA members and non-members can participate, with USTA members receiving a $10 discount on registration. Team registration closes on April 2, 2014. To register go to http://ustaflorida.com/teamtennischallenges. "Our new Team Tennis Challenges are a way to meet the demands and time constraints of parents and kids today," said USTA Florida Associate Executive Director Andy McFarland. "They keep kids active in tennis and provide them an opportunity to play on a team with their friends. The flexibility these events provide allows for more children to participate on a team in a shorter time period." 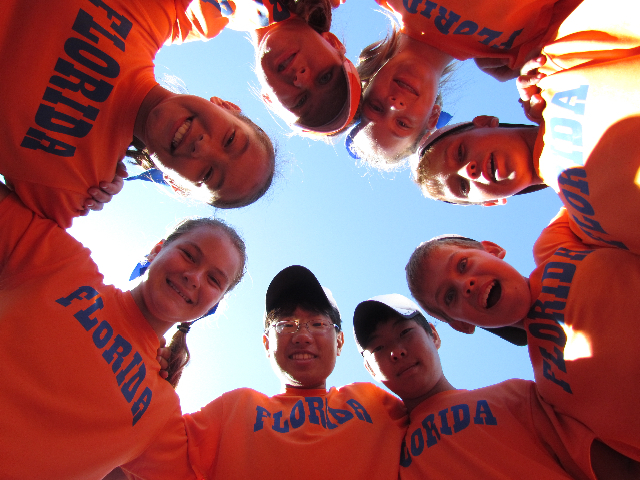 USTA Florida strongly encourages coaches to register teams early. "The partnership with USTA Florida Team Tennis Challenges is a great fit for Wilson Racquet Sports and our shared vision to attract more youth participation," said Erika Offerdahl, promotions manager for Wilson Racquet Sports. Coaches and players can also connect with USTA Florida via Facebook and Twitter using the hashtag #BYOTeamTennis. For more information or to register go to http://ustaflorida.com/teamtennischallenges. A number of community events will surround the Gainesville Women's Tennis Classic, a USTA Pro Circuit event, held on March 3-9, 2014, at the Jonesville Tennis Center in Gainesville, Fla.
On Saturday, March 1 the Community Tennis Blast, sponsored by Alachua County Government, will be held from 3-5 p.m. at the Jonesville Tennis Center. The event is free to all players and is for all ages, with drinks and snacks provided. "This 'Blast' is an introduction to the 10 and Under Tennis format," says Jonesville Director of Tennis Dave Porter. "Children will learn how to play tennis on courts and with equipment sized for them. Our goal is to introduce tennis to elementary-aged players in a format that will allow them to have instant success and fun. While the kids are playing, the adults can have fun joining in a Cardio Tennis court." The qualifying rounds for the Gainesville Women's Tennis Classic will be held on March 2-3, and Sunday, March 2 will include the Arts, Crafts and Tennis Fair presented by the Gainesville Fine Arts Association from 10 a.m. to 5 p.m. at the Jonesville Tennis Center. Activities will include fine arts and crafts, music, food, a children's art area, a children's area with the Sun Country Gym bus, a kiddie train, bounce house, hula hoop area, face painting and more. For more info go to www.jonesvilletennis.com.